Paf has a gaming portal which offers all kinds of gaming, but they don’t really use their start page to its real potential. A start page needs to attract players and give them reasons for staying, I think Paf really miss that. On Paf’s start page they just have navigation items and a few banners. As you can see they top navigation is: “Home”, “Slots”, “Bingo & Lotteries”, “Casino”, “Dice & Backgammon”, “Poker”, “Betting” and “Skill”. 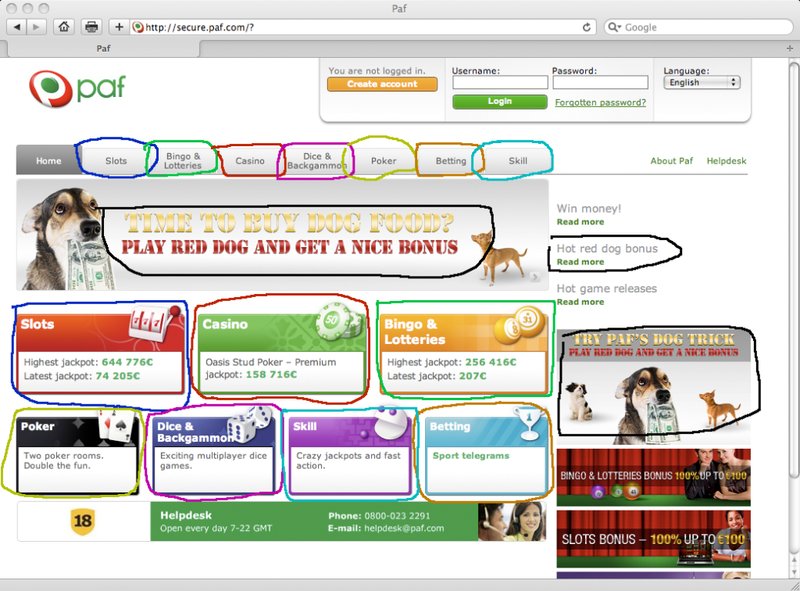 Below there is a banner “Red dog bonus”, which is also in two places in the right column. Below the banner there is the same items as in the top navigation. Why show everything once again? Paf should really work with their start page to make it more alive and inviting for the potential player. They could show top lists, number of players, new games and they should tell the player why they should sign up at Paf.